In our last post we explained how to have your business -or any business- show up on the Map Pack (the map that pops up at the top after doing a search on Google), you can click here to read it. This time we’re going to do a live audit for Organics, which is the list of businesses that show up right below the Map Pack. We have sparrowplumbingnc holding that No.1 position and carrboroplumbing at No. 2. Yelp is not a local plumbing business so we disregard it, which means the market is open for a stronger website to position themselves at #1 on both organics and the map pack. So let’s take a look at some of the factors causing one business to rank higher than the other. But before we take a look at backlinks, we need to define what a backlink is. Have you ever read a Wikipedia page? Ugly website but very helpful for this explanation. Feel free to click on that link, look at the picture of the elephant on the right side, there’s a link right below it that says “African Bush Elephant”, if you click on it, it will take you to another page that explains further about the African Bush Elephant, and you just clicked on a backlink. Essentially a backlink is any link that takes you to another page on the Internet. Remember, not all backlinks were created equal but this is enough material for another post. 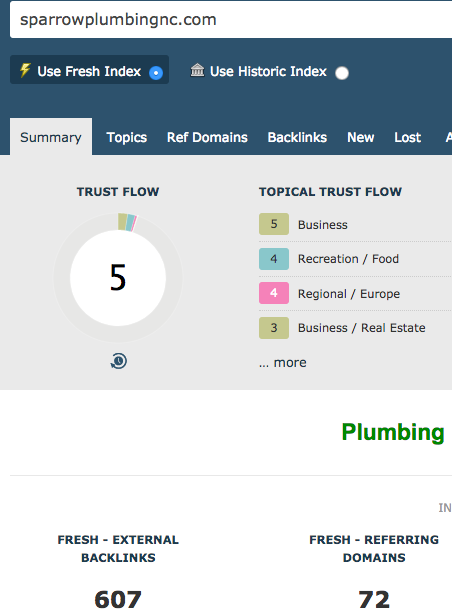 Now that we have a general idea of what backlinks are we can take a closer look at our friends the plumbers and how it all comes together. When it comes to SEO there are a lot of tools out there that will let you look into the metrics behind a website, we like to keep it simple so we work with SEMRush and Majestic. I like Majestic because you can look at backlinks and other valuable information that you can replicate to get similar results (providing that you’re consistent with working on your website, slow and steady wins the race). SemRush is useful to look at incoming traffic and keywords used by that website. Let’s start with Sparrow Plumbing, right below. This is the business currently showing at the top for the market in Chapel Hill. Taking a quick overview I can tell the amount of backlinks this website has, take into account that backlinks are just one factor out of the whole equation. Nonetheless, backlinks are the fuel that can move a website up or down (again, along with other factors, you can read my first post here). Below is business No. 2 Carrboro Plumbing. Even though not all backlinks carry the same strength to move a website just by looking at the amount of backlinks (607 v. 22) can give you an easy idea on where to start. 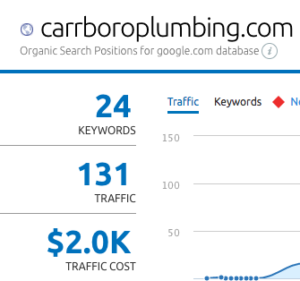 If Carrboro plumbing decides they want to climb all the way to the top, one of the things they would need to do is pay attention to the very few backlinks they have. We would recommend adding industry related backlinks to begin with. One might think that the difference in traffic between #1 and #2 is minimal but not so fast. 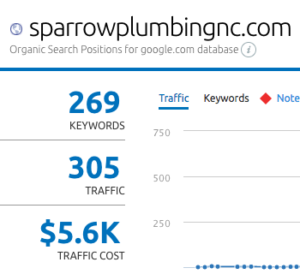 Here we have SemRush, take a look at Sparrow and Carrboro Plumbing side by side: The first thing to notice is the difference in traffic these two websites have. Sparrow almost doubles in traffic, and this is only in the past two weeks, even though Carrboro Plumbing is just one position below them. This confirms what Google has been stating for years, that most people don’t scroll past the first results (let alone go to the bottom of the first page). Basically, people need a plumber, they Google “plumber + city” and whoever comes up first is usually the one that gets the business, a big generalization I know but it’s true for the most part. Another thing to look at is content; content is king. While Sparrow has 269 major keywords on their website (this means they have written articles, blog posts or just web pages with those keywords), Carrboro Plumbing has only 24, keep in mind that Google shows websites based on how much the search engine trusts that site and trust comes in with more citations, more backlinks, more relevant content. 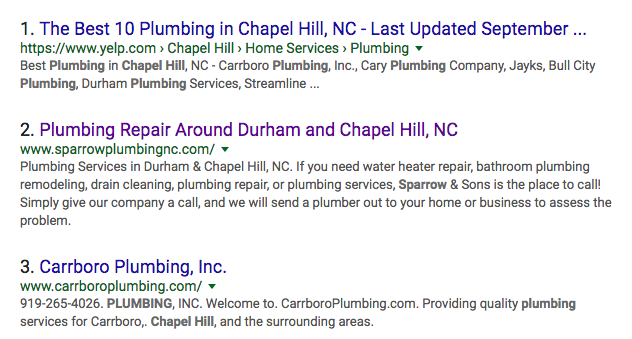 Carrboro Plumbing can definitely benefit from having more content/pages added to their site so when people type different keywords they come up higher in the ranks, if they have no content how are they going to show up? 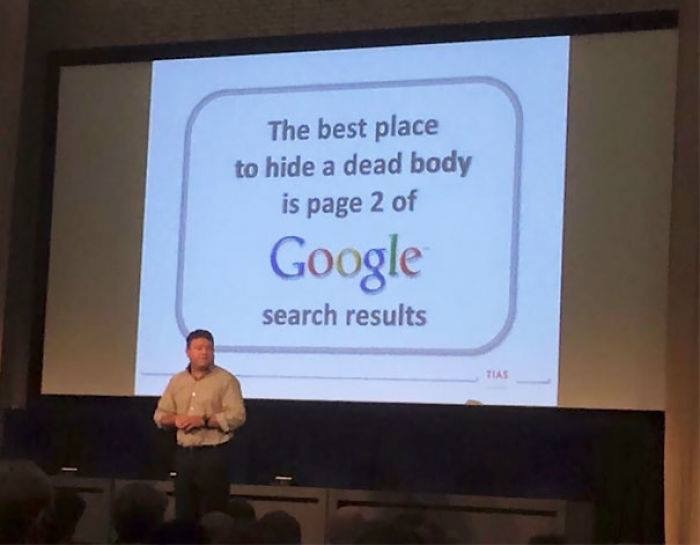 There’s no such thing as invisible content, if it doesn’t exist, Google will not find you. Not surprisingly Sparrow’s website has forty-two pages of content versus the only five pages that the people at Carrboro Plumbing have, this is not ideal. 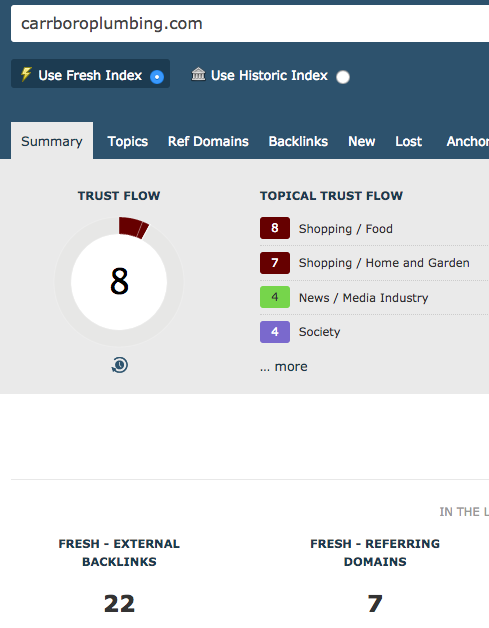 So adding more pages, more content, more citations and more relevant backlinks then rinse and repeat the same strategy in every area of SEO will “beef up” the smaller site and force trust with the big G over a period of time. Disclaimer: The businesses shown here were selected randomly. I am not associated with or endorsing them in any way.